It's that time of year again here.....the time of year when Carrie pretends that she is a great homesteader in the wild west (until poison oak erupts all over her arms and drives her back indoors to read). It's that time of year in which I carefully dig through a new set of "How to Be a Farmer" books and cook up some new ideas for how we can best take dominion over our land. This year I'm thinking about pigs. Surprising? I think yes. I've never thought about pigs before. But then we met some neighbors on a property nearby that had some and they spoke of the glories of pigs tilling your land and, um, fertilizing it. I asked them - to be especially clear - if it was ok for pigs to eat poison oak. "Oh yes," they said, "they will eat anything." I began to smell the bacon. So when I had an opportunity to review a copy of Homegrown Pork I leapt upon it and started investigating how much a pig pen would set us back. It should be noted that I asked the kids what they thought of raising a pig for food. It was a mildly disappointing concept because they were thinking of "pigs for pets" but they seemed to slowly take in. All in all, I feel like I can highly recommend this book as provided a good deal of thoughtful information as you consider raising pigs. Or not. 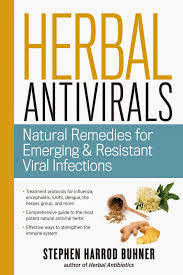 Herbal Antivirals: Natural Remedies for Emerging & Resistant Viral Infections . It just seems like - in this day and age - it's a good idea to find alternative methods to fighting off disease and/or limiting the length and severity of symptoms by more natural means. *Note: I also know that there is a big resurgence in the popularity of essential oils. I have a lot of friends on that bandwagon at present. I will concede the benefits from using them but I'm not 100% sold. In part, I really hate the smell. Essential oils have a very distinct odor and so do the users. It's not a completely intolerable smell to me but it is so distinct that I'd need a super good reason to want to use them. I give this disclaimer just in case someone pops up wanting to talk about oils. When I feel an absolute need to look into them, I will. Back to the herbs, I picked up Herbal Antivirals to learn more about how to handle respiratory illnesses, specifically, because those are probably the ones that concern me the most. This book offers information many types of illnesses but I was most interested in reading about influenza (since we hear so much about that year after year). The chapter on this subject dealt with the history of influenza, how it infects, plants that have been known to reduce symptoms, how influenza effects the body, how modern medicine has been and can be applied (the author is not a fan), a list of herbs and supplements, a recipe for cough syrup, information about essential oils and much more. The author of this book, Stephen Harrod Buhner, wrote the book because he is concerned about antibiotic resistance. He states that he is not writing this book to scare people, but to help educate them about viruses and how they can be treated (perhaps) more effectively and naturally without concern of the body rejecting/resisting these more natural plant-based solutions. I will tell you guys that this past fall and winter, our family started taking a daily dose of this elderberry syrup (linked to the recipe I used) and we have had the most healthy "cold season" to date. We skipped the flu but did catch a few colds. However, our symptoms were far less severe than in the past and our colds not as long in duration. I'm a believer! Keep Out! 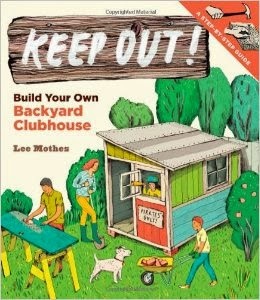 : Build Your Own Backyard Clubhouse is such a cool book. The kids and I browsed through it with glee upon its arrival a couple of weeks ago. We poured through the ideas and step-by-step plans and dreamed a bit. Turns out Bookworm1 has some pretty nifty ideas for a rather awesome sounding clubhouse. We are still cultivating our land and determining what things need to go where but a clubhouse is decidedly in the mix, perhaps a year or so from now. This book is great for gleaning some ideas. Also, there are lists of materials necessary for the different times and instructions, making this a very handy how-to. Involving kids in the dominion taking is an important aspect in the family life. We hope that our kids grow up to love the land and know how to work it (better than we have known) so that they can provide for themselves as much as they would like to do so. It's fun learning about how to grow things, take care of one's own needs, and to plan ideas for play and fun. Totally loving this aspect of life and grateful for the opportunity to review these books! Many thanks to Storey Publishing who sent these books my direction in order to facilitate this review. I received no additional compensation and all opinions are my own! My neighbor (farmers) raise pigs. She said it is costly to butcher them so I think they want to do it themselves now. They do eat everything...as in corn husks, egg shells, and other non-edibles. Crazy. My papaw (who'd be 102, were he still living) used to raise hogs (mostly for fun, though he did butcher thrm, so I guess it was really for food). Interesting. Eric and I briefly talked about getting some chickens a few years ago, but it never happened, and I'm OK with that. I have a friend who just got some rabbits to raise for meat--she said they're delicious, and I'll have to take her word for it. A friend sent me her elderberry syrup recipe, and I will have to compare it to the one you linked to. I used some this past season purchased from a reputable natural health company, but I would like to try making it. Do your kids find the taste tolerable? Definitely much easier and cheaper to make your own elderberry syrup. My kids love the taste...not like medicine at all. We have chickens, and they are pretty easy to raise. I am not sure about a hog, and I do not eat pork anyway. My attitude is that if you eat it, you should know how to raise and prepare your meat. Most people do not want to get that far! @*Carrie* - My kids love the taste. As Lisa said, it doesn't taste like medicine. My kids call it "medicine juice" and they ASK to take it! We have chickens and that's gone really well. Love the fresh eggs and the upkeep is manageable. They've been a great addition! Now that we've tackled chickens, we're feeling perhaps a bit over confident. :D Just researching at present! Love the "when Carrie decides she's a homesteader" - I have seasons where I very much want to "get back to the land" and raise all my own stuff, but am seeing God's mercy in giving me a decent-sized-but-not-large yard in the city. While we hope to someday move onto a bigger piece of land, our current space restraints help me to not jump the gun and overwhelm myself with some huge project. For now, I've been digging up beds everywhere for gardens and have a nice large compost pile going. Someday, though, I'm gonna have a pig for those non-compostables (dairy containing foods particularly - it rankles having to throw them away when I know they're biodegradeable).